If you are loving everyone around you making a dubbing video with the dubsmash app then Dubcrush is a great dubsmash app for you and your Windows 8 and 8.1 computer developed by Bubble Kartel. The app is available in different languages such as Hindi, English, Spanish, Malay, Arabic, French, Deutsche, Polish, Turkish, Chinese and many more. On the startup page of the Dubcrush app, select the language in which you want to record your dubsmash dubbing videos. 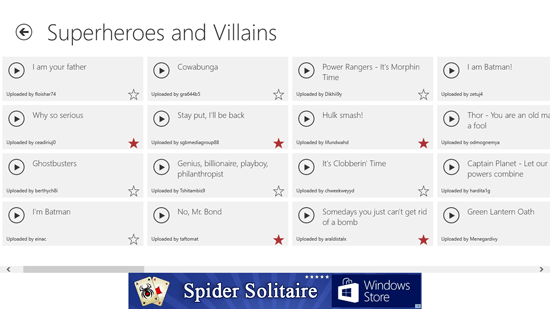 After selecting the language, you will be taken to another page where you will see top three trending sounds on the left side; followed by all sounds by the categories, the sound categories include trending, politicians, old school, comedy, food, party, tv shows, exotic, love, internet hits, swag, action, business, super villains and heroes, inspirational, hangover, dance, ads, diss, cartoon, pick up lines, musicals, birthday, video games, etc. 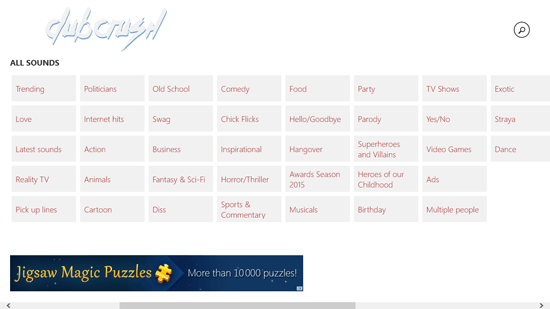 After the categories of dialogues you will see favorites section where all your favorite dialogues will be displayed in the form of a wide tile. The section of my dubs is beside it displaying all the dubbing videos you have recorded in the Dubcrush app. When you click on a category, another page opens giving you a list of dialogues under that particular category. To record a video of yourself dubbing for that dialogue you will have to click on the dialogue and it will open a new screen to let you record a video of yourself. The recorded videos can be sent or shared with your friends easily, you can also save the recorded video to your device without any problem. You can add different dialogues from different categories by clicking on the star icon below every dialogue. The app has clean user-interface with subtle color combination. There are no menu options apart from languages or Ok buttons on the menu dock for selection.